The MobileServe tech team has been rolling out updates throughout the past couple of months, and now that a few of the major features are complete, we wanted to share what's new. We're super excited about these changes and hope you will be too! Easily toggle between events that have already happened and those that are upcoming. 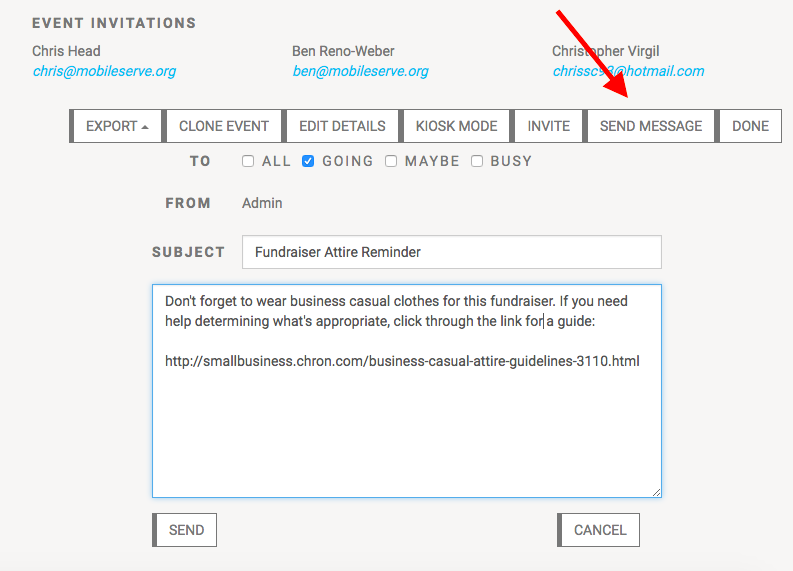 Use the “Send Message” button at the bottom of an Event page to send an email to invitees. The email can also include clickable links if you want to direct invitees to a certain web page outside of MobileServe. 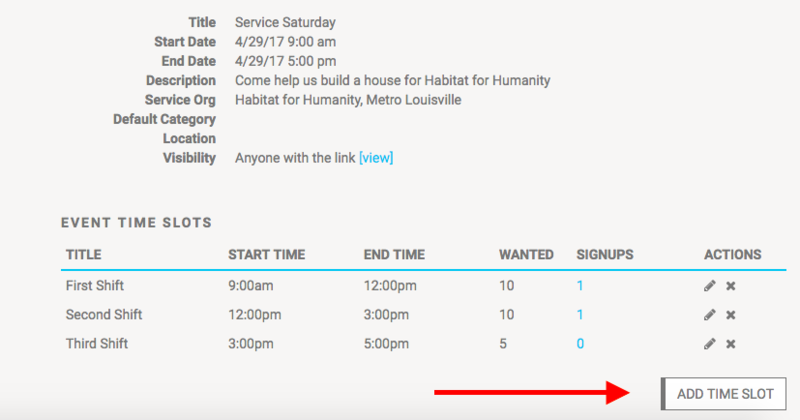 If you need volunteers for specific times and activities, you can now add timeslots to your Events. And when you use timeslots, your RSVPs will be based on who’s signed up. So a user can’t RSVP yes without signing up for a specific time. Easily export a list of your Event invitees to quickly see who’s going or to help the check-in process. The clone event feature let’s you easily duplicate an event. This feature is good when you have the same or similar events, but they’re not a regular recurring schedule. 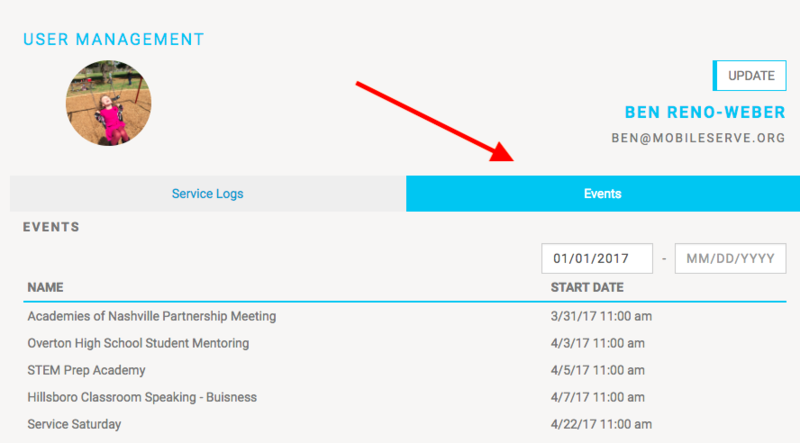 When creating a new event, you now have the option to make it recurring. 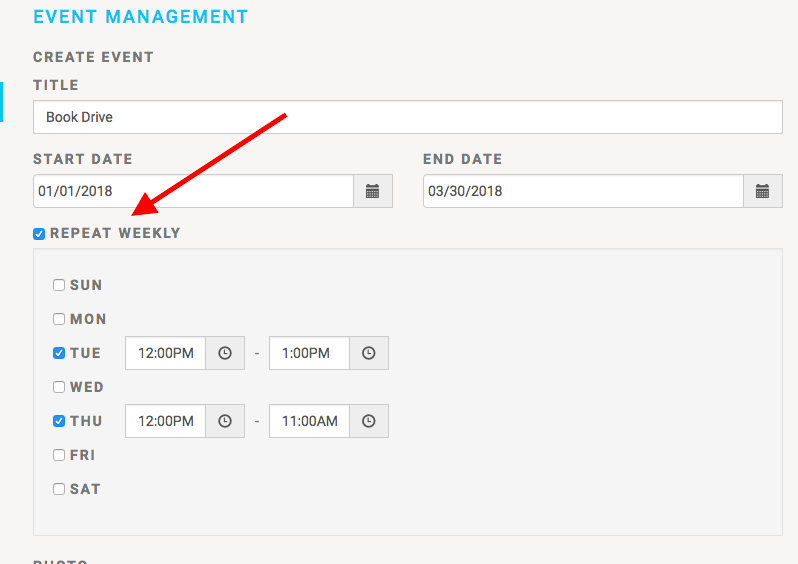 To use this feature, check the “Repeat Weekly” box when you’re creating the event, pick the day or days you want it to repeat, and adjust the time (you can have different times on different days). When you invite people to the event, they’ll see all the event dates and can RSVP just like normal. If you accidentally invited someone, if you have a max on your attendees, or if you simply want to clean up your RSVP list, you can now univite people to an event. All you have to do is go to the event, click Edit Details, and then choose “Uninvite” from the Actions dropdown next to the person’s name. The event will be removed from their list of invitations or events. Another feature we added is being able to see Events that specific users are attending. From the Users section of the Dashboard, click on an individual, and now there's an Event tab near the top. Clicking on that will show all events the individual attended or has RSVP'd as attending. From the user’s side of things, they can now access events they’ve declined, and they can change their RSVP. We’ve also made it easier to see which events they’ve been invited to and which ones they’ve responded to by choosing either Schedule or Invitations on their Events page. Schedule will show all Events they’ve RSVP’d to, while Invitations shows those waiting on a response. Verifying service has always been a key part of MobileServe, and we’ve made several updates to make this feature even more helpful. Admins now have the option to auto-approve service logs that have been verified. You can choose which types of verification lead to auto-approval, and whether a log has to have multiple types of verification. For example, you can say any log with an email verification and a photo is auto-approved. Or you can say a user can have a signature, or email verification, or a geo-location to be auto-approved. It’s completely customizable! Auto approval is turned off by default, but you can make changes under your Dashboard Settings. Major changes to a service log will continue to remove previous verifications. But now, if a user updates the log description or changes the service category, the verification will not be removed. This should make it easier to ask users to make minor changes that shouldn’t require the log to be verified again. Because more of you are using photo verification, we’ve added a new icon to make it easier to see which logs have photos. From your Dashboard Service Logs page, you’ll now see a camera icon under the Verification column and on individual service logs if you click through for details. Users can now add or delete a photo to a service log after it’s been created. This will be especially helpful for people who use photo verification. Admins can now change or remove the service category on any log. So instead of rejecting a log and asking the user to change the category, Admins can go to Service Logs, View the log, select the current Category, then choose Change Service Category from the Actions dropdown. If you reject a log and ask the user to change the description, the log will revert back to No Status when they’ve made a change. This should make it easier to see which logs still need to be reviewed. We hope you like this new, more streamlined MobileServe. Let us know if you have any questions.